Anyone know where this is from? Filming or a promotional event of some kind? I notice a lot of arabic clothing in the crowd. Never trust a machine that can be foiled by string. I don’t think there were really that many people there. Cool as this looks, the shadows are at an incorrect angle to be real. 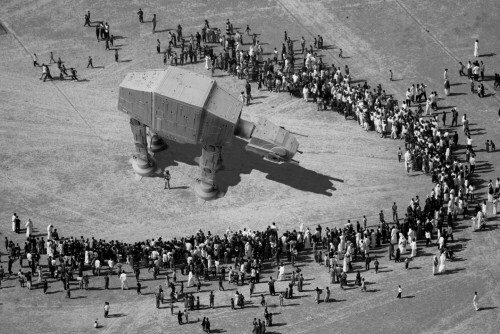 Not only are the angles wrong but also the man stood next to the at-at is way out of scale with the crowd.